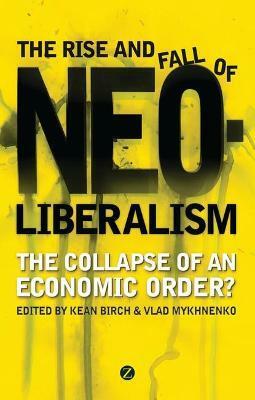 The Rise and Fall of Neoliberalism : The Collapse of an Economic Order? The recent, devastating and ongoing economic crisis has exposed the faultlines in the dominant neoliberal economic order, opening debate for the first time in years on alternative visions that do not subscribe to a `free' market ethic. Bringing together the work of distinguished scholars and dedicated activists, The Rise and Fall of Neoliberalism presents critical perspectives of neoliberal policies, questions the ideas underpinning neoliberalism, and explores diverse responses to it from around the world. Magnus Ryner, Oxford Brookes University. Kean Birch is a lecturer in the Department of Geography and Sociology at the University of Strathclyde. Previously he was a research fellow in the Centre for Public Policy for Regions at the University of Glasgow. His main research interests concern the social and geographical basis of different economies and especially the implications that new knowledge, science and technologies have for these economies. He teaches courses on globalisation, neoliberalism and knowledge-based economies. Vlad Mykhnenko is a research fellow in the Department of Geography at the University of Nottingham. Previously he was a research fellow in the Centre for Public Policy for Regions at the University of Glasgow.